In his Lives, Plutarch compares the biographies, but not their speeches, of two of the greatest of the classical orators: Demosthenes, the Athenian, and Cicero, the Roman. Their lives had many close similarities, which perhaps predisposed them to their profession. The father of Demosthenes had a large factory employing skilled (slave) workmen, but died when Demosthenes was only seven. Unfortunately, his subsequent guardians took much of his inheritance, and didn’t leave enough to pay the boy’s teachers. His mother wouldn’t allow him to undertake any physical work, so he grew up lean and sickly. He acquired the ambition of excelling in oratory when, as a youth, he heard the famous Callistratus in action in court, and saw the way his skills were appreciated afterwards. He therefore became a pupil of Isaeus, and when he came of age brought lawsuits against his guardians, and wrote speeches attacking them. He then learned another important early lesson: although he won his case against his guardians, he was unable to recover much of his inheritance from them. He then turned to more public speaking. This brought him some failure, but other orators provided helpful advice, with which he steadily improved. He had an underground practice room built, into which he descended each day to train, and sometimes spent periods of two or three months there, honing his skills. He also listened to the speeches of others, analysing their arguments in great detail. But he was a calculated and deliberate speaker, and rarely tried making a speech on the spur of the moment. He made his voice more distinct by practising with pebbles in his mouth, recited speeches and verses in a single breath and when exercising, and practised in front of a mirror. Jean-Jules-Antoine Lecomte du Nouÿ (1842–1923), Demosthenes Practicing Oratory (1870), media and dimensions not known, Private collection. Wikimedia Commons. 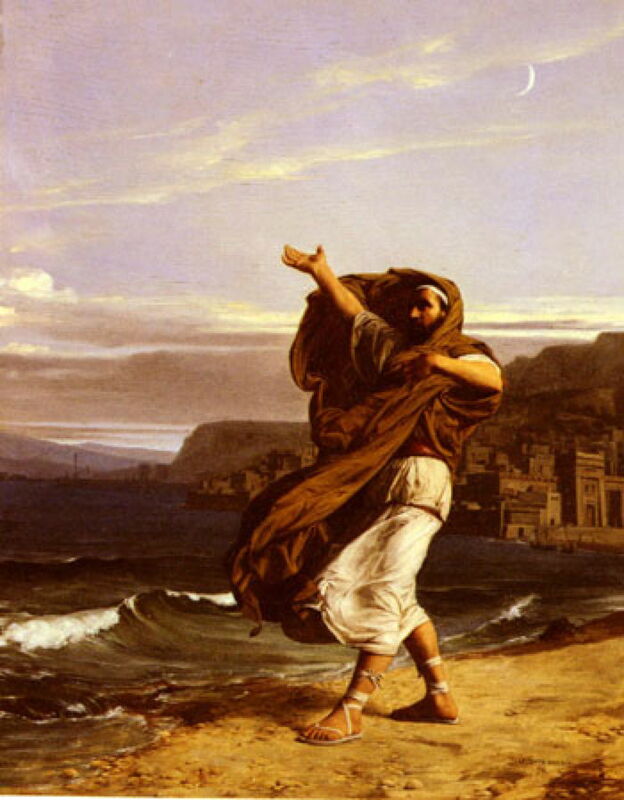 Plutarch doesn’t mention him going through his speeches when walking along the coast, as shown in Jean-Jules-Antoine Lecomte du Nouÿ’s painting of Demosthenes Practicing Oratory from 1870, although this makes for a more interesting image than showing him in his cellar. He engaged more in public matters after the start of the Phocian War. Although he wasn’t altogether inaccessible to bribes, he seldom spoke against his beliefs. When nominated to conduct an impeachment, for example, he refused. He responded that he was prepared to serve as a counsellor, but not as a false accuser. Louis Loeb (1866–1909), Demosthenes before the Athenian Council (1898), further details not known. Wikimedia Commons. 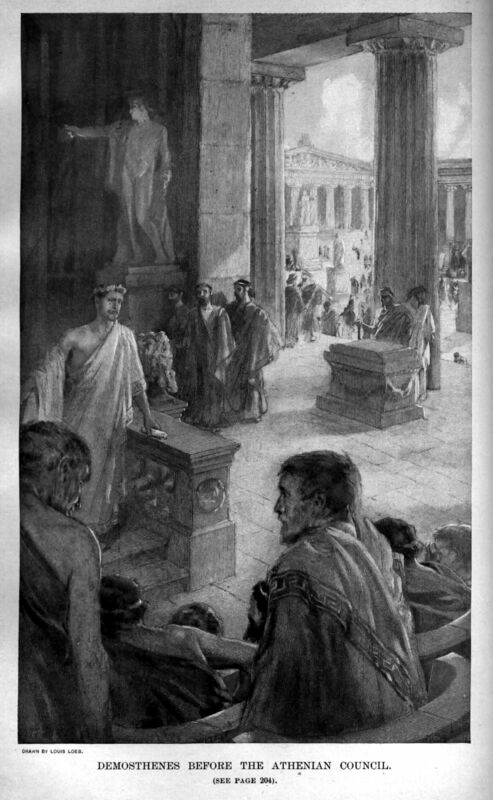 Louis Loeb’s Demosthenes before the Athenian Council from 1898 was engraved and used as a book illustration. Demosthenes was also prepared to write speeches for others to use, something that he did for Apollodorus on several occasions. He was a strong opponent of the peace with Philip of Macedon, and was one of a group of ten Athenians sent to the king as an embassy. Demosthenes continued to stir the Athenians up against the Macedonians, urging them to invade Euboea. He was then sent to other Greek states, to encourage them to help raise forces to oppose Philip. Demosthenes was brave in supporting the Athenians and Greeks, but had no bravery when it came to battle, and was among the first to run away. For this, his opponents criticised him, but the people remained happy for him to engage in public affairs, and invited him to give the eulogy for the remains of their fallen warriors when they were repatriated later. Demosthenes urged the Greek league to make war on Alexander the Great, but when he was sent as an ambassador to Alexander, he abandoned the mission for fear of the Macedonian’s wrath. 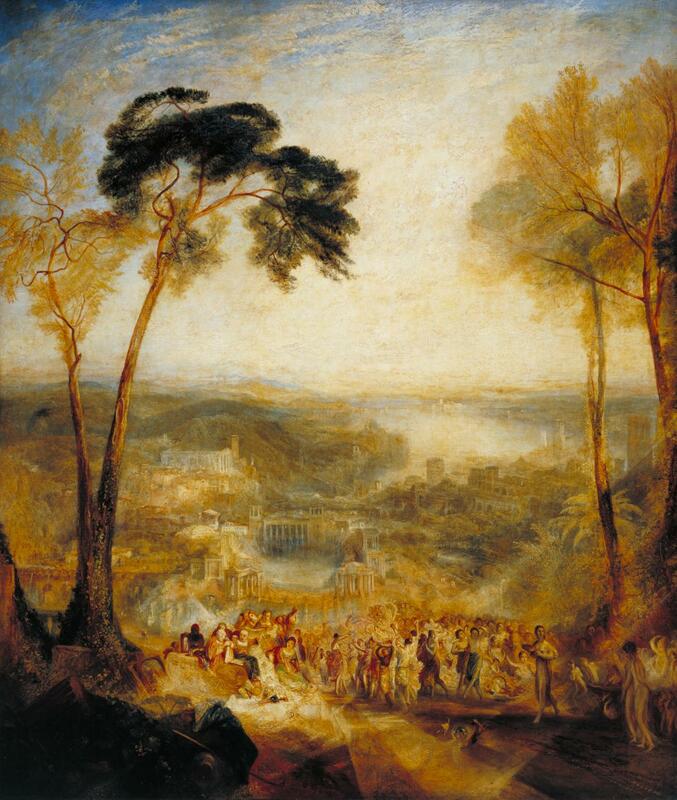 JMW Turner’s curious composite narrative of Phryne Going to the Public Baths as Venus: Demosthenes Taunted by Aeschines from 1838 apparently combines two legends about courtesans of the day. Phryne was a famous courtesan born in about 371 BCE, who is best-remembered for her legendary disrobing during her trial for impiety, famously painted by Jean-Léon Gérôme. Here she is celebrating the festival of Poseidon by going naked to bathe in the sea, as if she were the goddess Venus. At her trial, Phryne was defended by the orator Hypereides rather than Demosthenes, who lived between 384-322 BCE, so was a contemporary. Somewhere among the crowd, Demosthenes is supposed to be taunting his rival Aeschines (389-314 BCE) for being the son of a courtesan (but not Phryne), which would seem an unwarranted ad hominem, and is not mentioned by Plutarch. As Alexander made his way conquering through Asia, Harpalus had to return; Demosthenes accepted a large bribe from Harpalus, which quickly became public knowledge. He was fined fifty talents for this crime, in lieu of which he would have to go to prison. Demosthenes therefore fled Athens and went into exile. When Alexander died, Demosthenes applied himself to persuading other Greek states to join another league to expel the Macedonians from their lands. He was therefore given permission to return from exile. Shortly afterwards, the Greeks were soundly defeated, and a Macedonian garrison installed. Demosthenes had no alternative but to return to exile, and in his absence he was sentenced to death. Demosthenes took refuge in the temple of Poseidon at Calauria, where he was confronted by Archias, sent to arrest him. Demosthenes retired into the temple as if to write; he there bit his pen, which he had loaded with poison (there are also claims that the poison had been concealed in a bracelet). As that took effect, he trembled and became unsteady, went past the altar, and there fell dead. 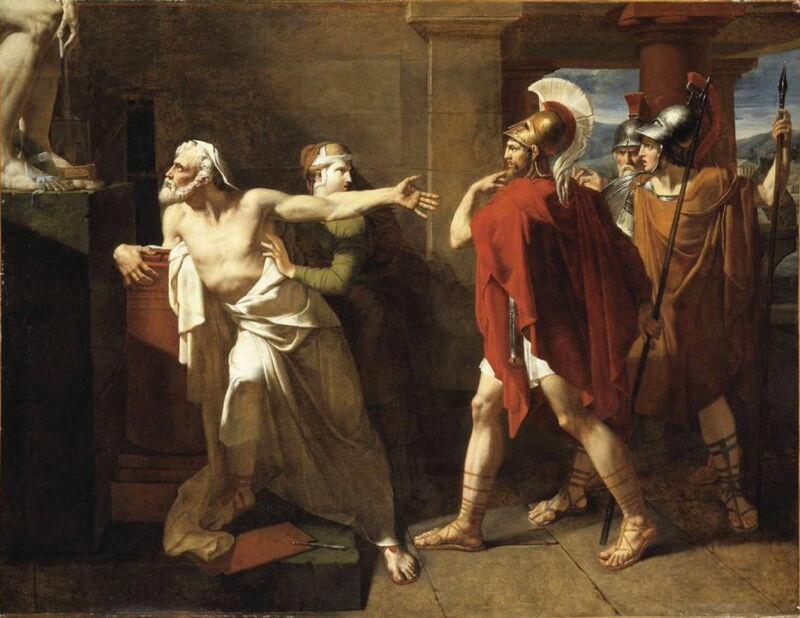 Felix Boisselier (1776-1811), The Death of Demosthenes (1805), oil on canvas, 113 x 145 cm, Musée du Louvre, Paris. Wikimedia Commons. The Death of Demosthenes has been the subject for the prestigious Prix de Rome on at least two occasions. The first was in 1805, when Felix Boisselier won it with this work. He won the Prix a second time the following year, only to die in 1811. Demosthenes looks up at the statue of Poseidon, clinging onto the altar as he weakens. His pen has fallen to the ground, and his left arm is outstretched towards Archias as he approaches to arrest him. Camille-Félix Bellanger (1853-1923), The Death of Demosthenes (1879), oil on canvas, dimensions not known, Private collection. Image by VladoubidoOo, via Wikimedia Commons. 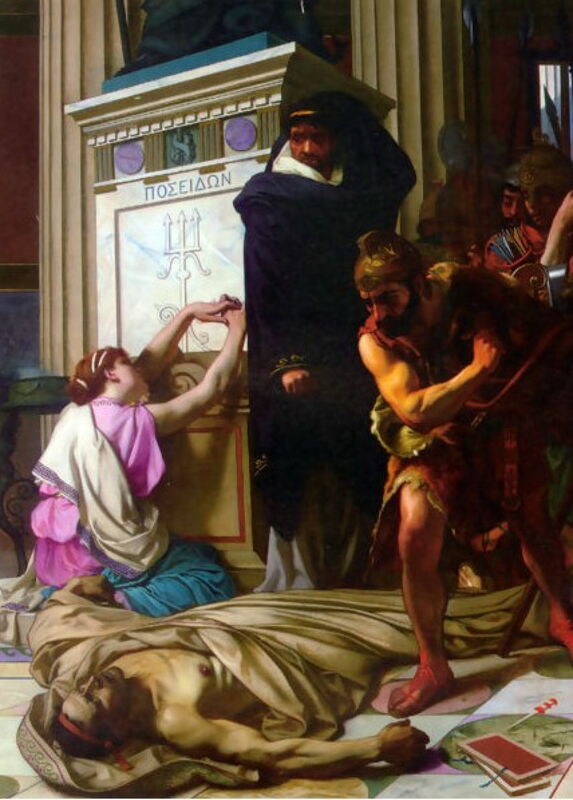 This was set again as the subject for the Prix in 1879, and Camille-Félix Bellanger’s unsuccessful entry shows the body of Demosthenes laid out on the ground, his pen now out of his reach at the far right. Archias is visibly frustrated by his rapid suicide. Behind them a young woman kneels at the altar to Poseidon. 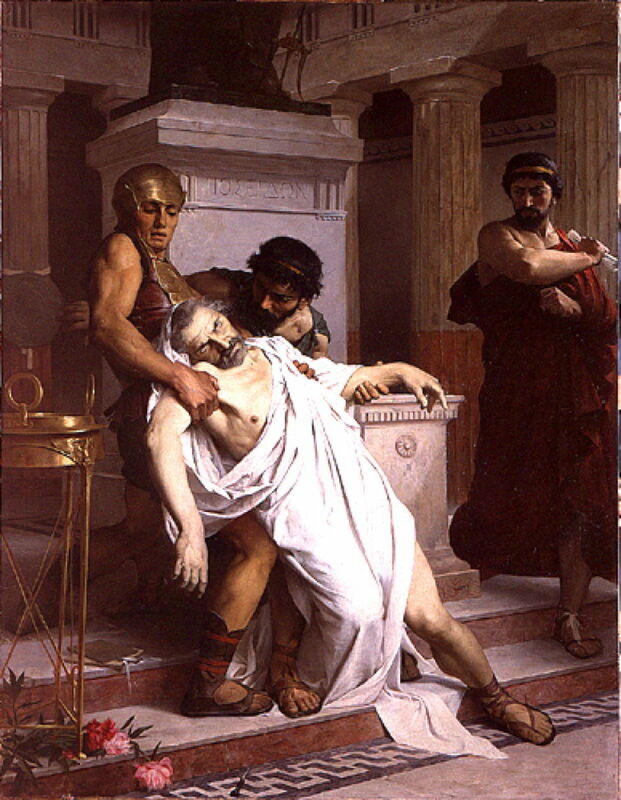 Émile-Jules Pichot (1857-1936), The Death of Demosthenes (1879), oil on canvas, dimensions not known, Musée Paul Valéry, Sète, France. Image by VladoubidoOo, via Wikimedia Commons. Émile-Jules Pichot was also unsuccessful that year, showing Demosthenes fading away at the foot of the altar, writing tablets visible, and a suggestion that the pen is by his right hand. 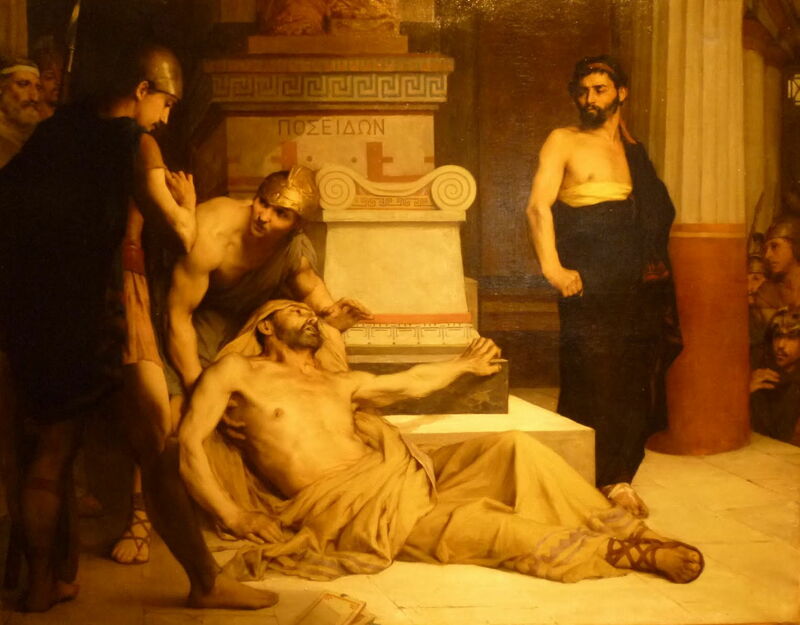 Alfred-Henri Bramtot (1852-1894), The Death of Demosthenes (1879), oil on canvas, dimensions not known, Ecole Nationale Supérieure des Beaux-Arts, Paris. Image by VladoubidoOo, via Wikimedia Commons. The winner was Alfred-Henri Bramtot, who shows Demosthenes’ limp body being supported from falling in front of the altar, with Archias angry and frustrated at the far right. The altar tripod is at the left edge, and the orator’s pen and writing materials are behind it. The Athenians erected a statue in honour of the orator Demosthenes. Demosthenes, whole text in English translation at Penelope. Posted in General, Life, Painting and tagged Bellanger, biography, Boisselier, Bramtot, du Nouÿ, Loeb, narrative, painting, Pichot, Plutarch, Turner. Bookmark the permalink.